Hollandaise Sauce is addictively delicious, so tasty a topping it could almost make a slab of cardboard seem edible. The classic egg sauce can be a bit touchy to prepare, requiring a double boiler, barely simmering water and a bit of patience as you whisk in the melted butter. Use too much heat and you risk scrambled eggs. Unsightly separation is another common challenge with this classic sauce. So why bother? 1) Because this emulsified combination of egg yolks, lemon juice, butter and a touch of hot sauce is so amazingly delicious and 2) because it's so amazingly easy and foolproof to prepare using a blender. Purists may proclaim blender Hollandaise an imposter, a second-rate wannabe, but this method produces a tasty sauce that's welcome in my galley. Hollandaise is the sauce for Eggs Benedict, a favorite topping for asparagus or broccoli, and it has graced more than a few crab cakes and seafood crepes. 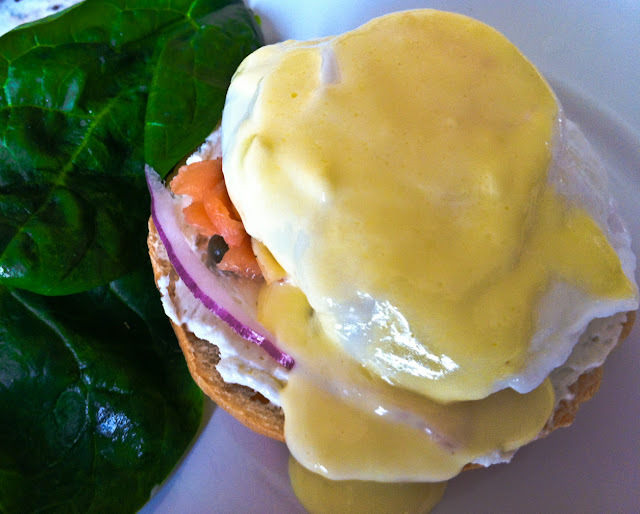 Recently we hosted a weekend brunch featuring Lox Benedict. While not exactly low calorie health food, it was over-the-top delicious. Melt the butter in a small saucepan over medium heat until foaming, but not browned. Remove from the heat. 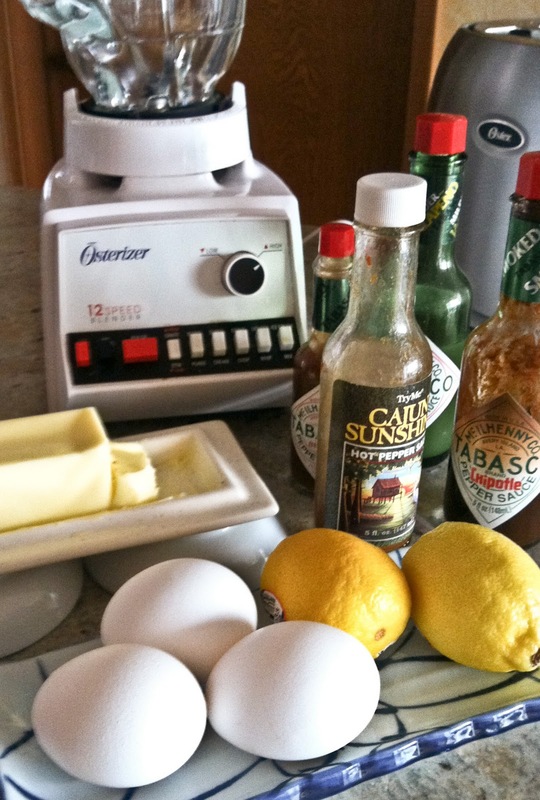 Place the lemon juice, hot sauce and egg yolks in a blender; cover and whiz to combine. Keep the blender running, remove the cover's insert and very, very slowly drizzle the hot butter in a thin stream of droplets into the blender. The sauce will become creamy and thicken. Taste and adjust with salt, pepper and additional lemon juice as needed. Use as soon as possible, this sauce does not hold well. Snowmageddon! that's what the newspapers called our recent snow and ice storms, and now a series of wind events are stacked up off the west coast. Oh joy, TV weather dudes see more power outages on the horizon. This blustery January weather calls for a hearty, comforting soup, something easy to prepare, something special that invites you to linger over a steaming bowl of deliciousness. This longtime favorite recipe comes from an old leather-bound cookbook by Mary and Vincent Price - yes, that Vincent Price, the actor. A Treasury of Great Recipes was printed in 1965 but it remains a well-used resource today. My copy arrived that very year as a Christmas present from RL. It holds special status as the first cookbook he ever bought for me. I still smile when I read the Christmas card and its message tucked inside the front cover: "...have fun making good things happen!" This soup is one of those good things. The Price's recipe found them one cold, rainy day in Venice, recommended by the owner of a small restaurant whose name they didn't recall. I'm delighted they remembered the soup recipe; it has warmed us up on many cold, rainy days in Seattle. It's even been a success as a starter to a couple of dinners and is always well received. Try this one, it's a keeper. 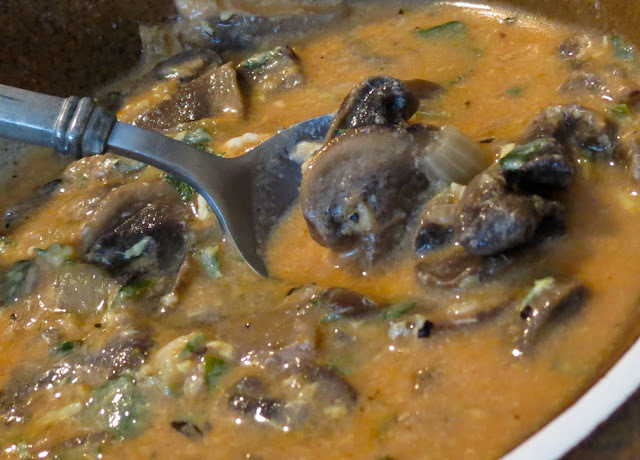 Stir in the sliced mushrooms and saute for 5 minutes, until they soften and turn golden. Add tomato paste and mix well. Add the chicken stock. Stir to blend and add the sweet vermouth. Add salt and pepper to taste. Simmer for 10 minutes. Beat together the egg yolks, parsley, Parmesan cheese and lemon zest. Butter and grill one side only of thick slices of French bread. Place one slice of bread in each soup bowl. Optional: Garnish with additional parsley, Parmesan and lemon zest. This might have been was a bit over the top, but I couldn't resist the temptation. Blame it on the snowstorm, Seattlites do get a little crazy when it snows. Six inches of snow followed by an ice storm meant I didn't drive anywhere for the better part of a week. I hung out in the kitchen and cooked up kettles of soup, pots of chili, even beef stroganoff for goodness sakes. Then cookie madness struck, along with a craving for bacon. A Google search for bacon cookie recipes produced over 20 million hits; obviously this was not a new idea. I went with a recipe from SeriousEats, skimming it quickly to be sure all of the ingredients were on hand. 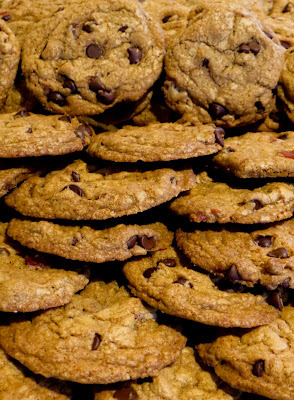 I should have read it more thoughtfully, realizing that a pound of bacon, 4 cups of flour, 3 cups of chocolate chips, 3 cups of sugar and a cup and a half of butter would make a huge quantity of cookies. Hilary and I measured, mixed, shaped and baked batch after batch of these cookies - a hefty five dozen in all. 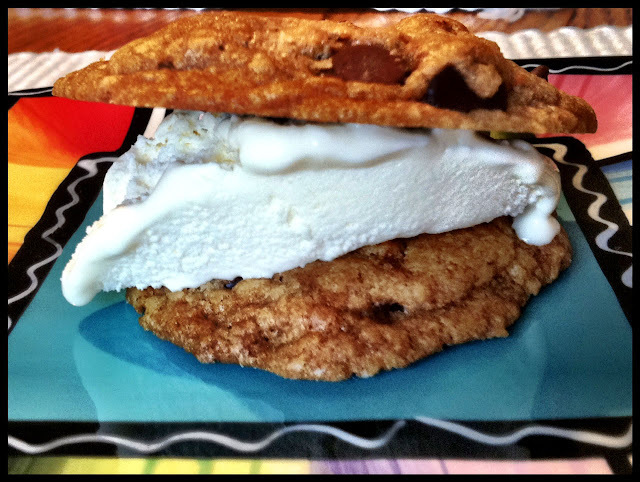 We sampled warm cookies, cooled cookies and finally cookie ice-cream sandwiches. Meh. This recipe didn't overwhelm us with goodness, or even bacon flavor. 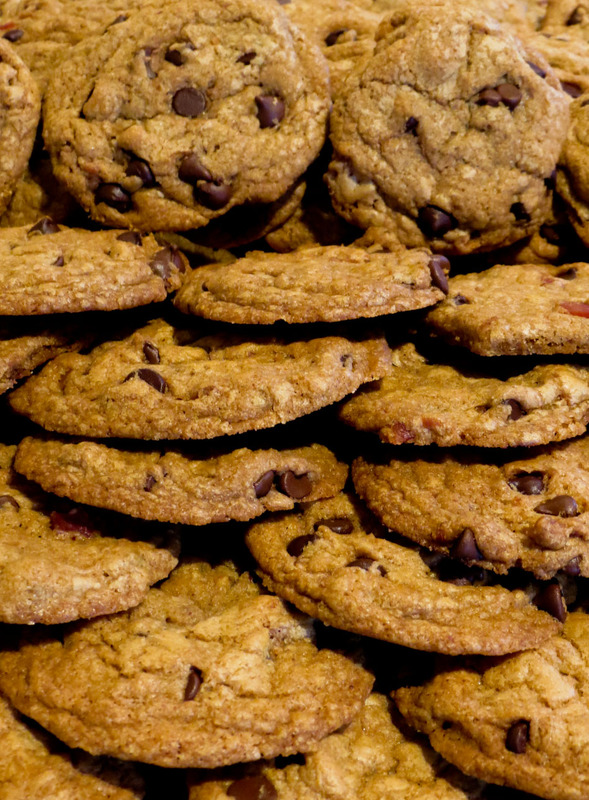 The cookies were just okay, overly-sweet chocolate chip cookies. I'll stick to my usual, more traditional chocolate chip recipes in the future. But if you care to check out the SeriousEats recipe, perhaps tweak it to suit your taste, use this link. If you're in the neighborhood, now that the snow has melted, c'mon by for coffee and cookies. I have dozens to share. 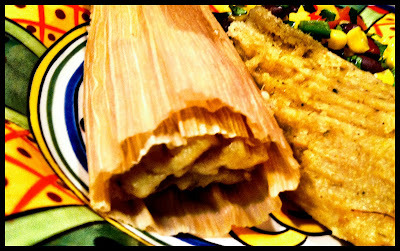 Tamales, oh how I love those tempting, little packages with their savory, spicy filling snuggled inside fluffy masa, all wrapped up like presents in their corn husks or banana leaves. Tamales can be soul-satisfyingly delicious, or they can be dreadful disappointments with minimal filling and leaden dough. 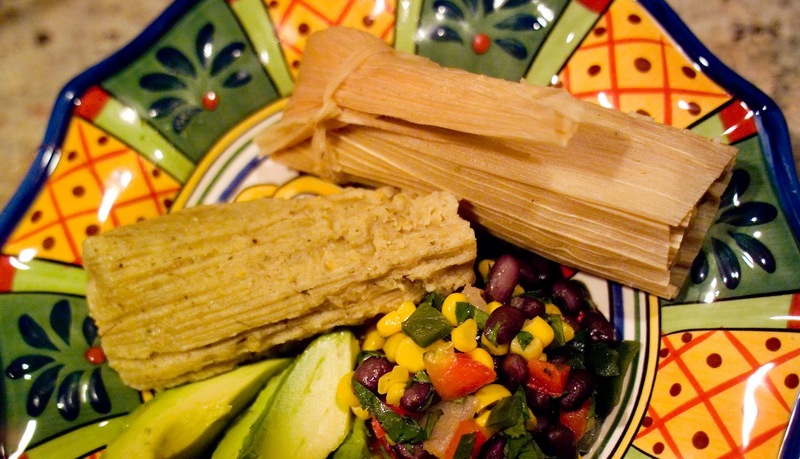 It's a risky business to order tamales at an unfamiliar restaurant or street cart. 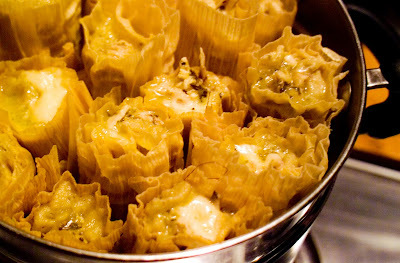 To misquote Forest Gump, "Tamales are like a box of chocolates. You never know what you're gonna get." Recipe research was interesting, turning up dozens of small variations in ingredients, quantities and methods. I favored a couple of recipes from the Too Hot Tamales Feniger & Millikan, especially the one in Cantina, and incorporated a few adjustments from a handful of other books on my shelves. Typical directions began with masa, added liquids and finally added the lard a tablespoon at a time. I tried that approach and my KitchenAid bounced around on the counter, flinging big blobs of dough out the top. Next time I will begin with the lard, beat it until fluffy, add the masa and beat some more, and then add the moist ingredients (as suggested in another cookbook). Even without the recipe research, tamales take time, lots of time. It's worth it. Better yet, invite some friends to join in the fun. 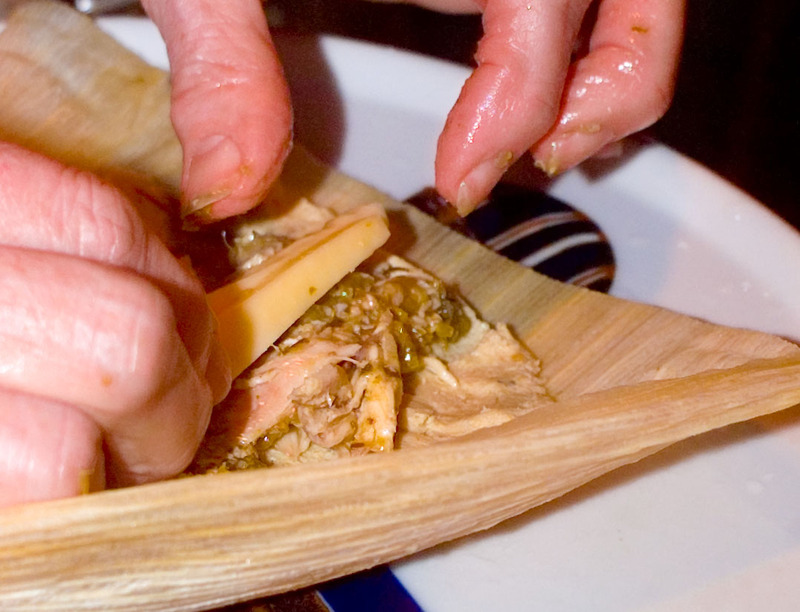 Host a tamalada, a tamale-making party where the preparation is as much fun as the eating. For the filling: Shred the cooked chicken into chunky strips no more than 2 inches long and pile into a bowl. Add the salsa, spices, salt and pepper: lightly toss to mix, keeping the mixture loose not packed. Set aside with the cheese strips. For the dough: Use a blender to combine the chicken broth, salsa, baking powder, salt and pepper: whir until smooth. Set aside. Put the masa in the bowl of a stand mixer and whiz it about a bit. Slowly add the chicken stock mixture; mix until combined. I needed additional broth to loosen up the dough - it wanted to pack into a heavy ball and climb out of the bowl. Increase the speed to medium-high to high and add the lard a tablespoon at a time. Beat until light, almost fluffy, about 15 to 20 minutes. To form the tamales: remove the corn husks from the water, drain and pat dry. Fan open up 1 large or 2 small husks and place on the table with the skinny ends pointing toward you. Thinly spread about 2 generous tablespoons of dough on the upper half (wide end) of the husk, leaving an uncovered border at the top and sides. Put a heaping tablespoon of filling down the center of the masa; place 2 skinny strips of cheese on top of the chicken filling. Fold the long right edge of the husk over the filling, rolling the masa over to cover the cheese and chicken. Fold the long left edge back over the filling to form a cylinder. Fold the skinny end up; wrap a long strip of torn corn husk around the cylinder and tie a knot to secure it (optional step). Repeat these steps until you run out of filling or husks. Note: There are several other methods of wrapping and rolling, tying or not tying. Choose one that suits you. Steam the tamales: Set the tamales in a steamer with the open ends facing up. Place the steamer insert over a pan of simmering water. Be sure the water doesn't touch the husks! Cover and steam about 1 to 1 1/2 hours, or until the masa pulls away from the husks. Add boiling water as needed to the pot to keep it steaming. To serve: Place the tamales on a platter or serve individually, 2 tamales per plate. Offer salsa, crema and other optional toppings. Soft-fried eggs are popular in some homes (not mine). Diners will unwrap their own tamales, so have bowls handy for the discarded cornhusks. Note: Tamales freeze well and hold for several months. Let them cool to room temp, then wrap each tamal individually in plastic wrap. Twist or fold the ends and store them in ziplok bags in the freezer. Nuke one in the microwave for 1 to 2 minutes, and that's all it takes. You can steam a larger quantity in a pot for about 20 to 30 minutes. Preparing a meatless meal is no great feat, not even a big deal... unless you focus on it... worry it to pieces... let it make you crazy. There are so many easy choices, but today they all seemed too ordinary. Cheese pizza? Tomato/red pepper soup and grilled cheese sandwich? Stir fry rice bowl? Nope, tasty but too routine and lunch-like. What should I make? It seemed important that our first official meatless Monday celebrate big flavors and not leave us feeling the tiniest bit deprived. A quick wander down the produce aisle took care of my menu problems. Fresh, plump portabella mushrooms and Mayan sweet onions hit the basket first. Then a giant bouquet of kale and a smaller corsage of basil joined the party. Grown-on-the-vine tomatoes were next, followed by a box of Clementines. I knew the fridge still held various Basque cheeses, tasty chunks and wedges left from holiday cheese plates. Homemade burger buns lurked in the freezer and, thanks to our mild winter, a few herbs still looked good in the garden. I was in business. Lunch featured burgers of grilled portabella mushrooms that had been brushed with a fresh herb vinaigrette. The 'shrooms were piled on top of caramelized sweet onions and slices of fontina cheese, all that goodness layered on grilled sourdough buns. Add some lettuce, tomato, a bit of coleslaw with that same vinaigrette, a splash of HP sauce, and Oh, my! that was one awesome burger. We didn't miss the meat at all. Clementines and more coleslaw finished off a very satisfying lunch. I built two pasta sauces for dinner, one a red sauce and the other a white cheese sauce. Cavatappi, wilted kale, Basque idiazabel (sheep's milk cheese) and piles of basil shreds were featured in both dishes. Tangy vinaigrette-dressed greens with citrus and pine nuts completed the meal. 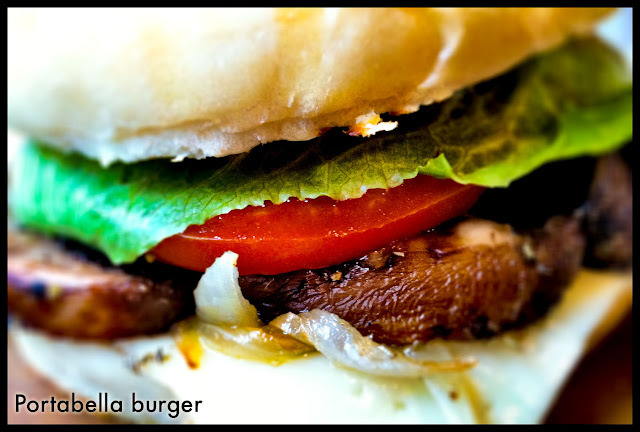 We enjoyed the pasta entrees, and once again didn't notice the lack of meat, but we're still talking about those amazing 'Bella Burgers. Note: iPhoneography - I didn't even know the term last month and now I could be an enthusiast. CreativeLive's on-line workshop on January 5-6 was terrific, both informative and encouraging, and gave me a much-needed push to play with the iPhone's camera feature. Now I 'm committed to using the smartphone as a camera more often, and posting some photos weekly (at least). CameraPlus is my new favorite phone app, with more cool features than I can handle right now, but I'm working on it. So many projects, so little time? Preheat a ridged grill pan over medium heat on the stovetop. Coat the cleaned, thick-slices from 2 large mushrooms with some vinaigrette and let marinate for 10-20 minutes. Use the remaining vinaigrette to dress some cabbage slaw. Heat a scant tablespoon each of olive oil, butter and vinaigrette over low-medium heat in a cast iron skillet. 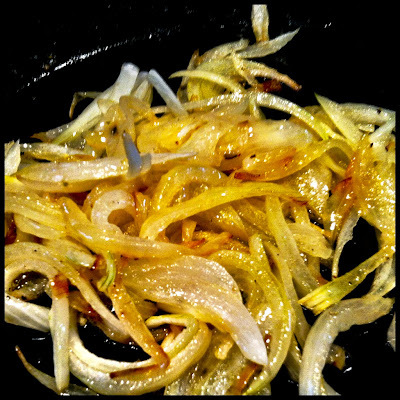 Cook the thin slices from 1 large sweet onion, stirring occasionally, until golden and caramelized, being careful not to burn or crisp the onion. Set aside. Toast the cut sides of the burger buns on the ridged grill pan. Set aside. 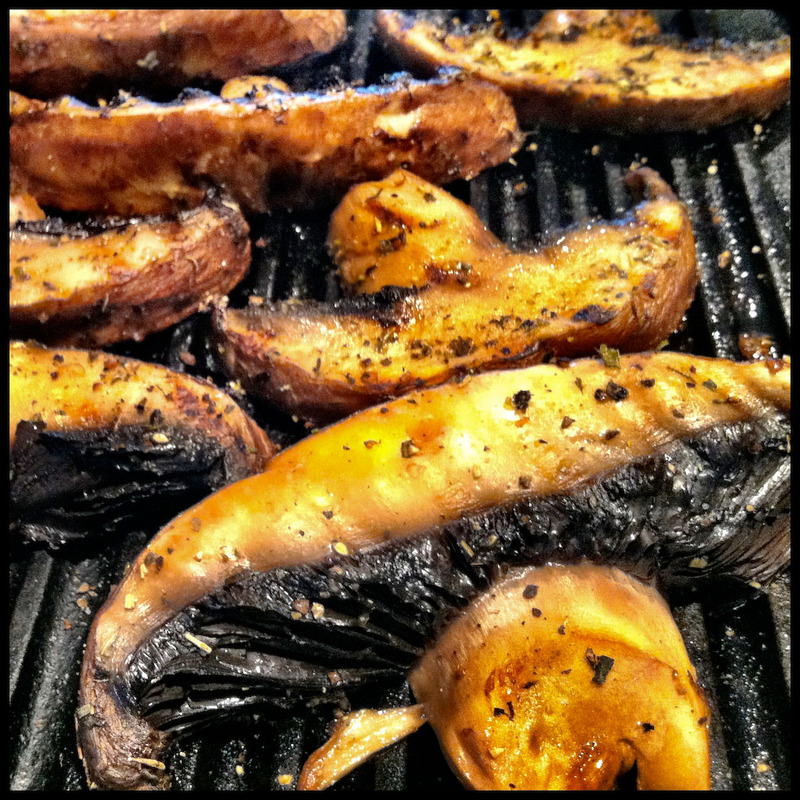 Grill the marinated mushroom slices for 3-4 minutes per side; move around to get pretty grill markings. 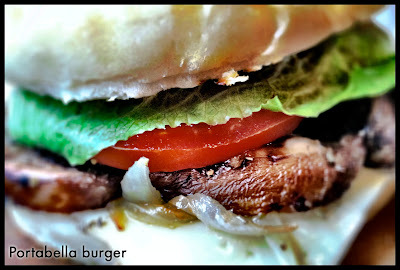 Build your burger using your choice of spreads, cheeses, vegetables, etc. *Yes, I might consider adding strips of crispy bacon if it weren't Meatless Monday. Wow, 2011 departed in a rush and suddenly it's a week into the new year. 2012, it's here already, how did that happen? I'm still stuck in holiday mode with the Christmas tree only half naked, interesting items lurking on refrigerator shelves, and wild disorder in my workspaces. What have I been doing this past week? Whatever, one burst of activity will handle the surface chaos and set the stage for a terrific new year. Looking ahead, it's time to focus on (1.) preparing lighter, healthier meals and (2.) growing more comfortable using my iPhone as a camera. These are both typical New Year's statements, resolutions too general to be useful or easily measured. A modest step in each category, an action to accomplish during January, would be more realistic. Okay, here goes, public statements of intention. 1. I will try a Meatless Monday commitment and prepare tasty, healthy meals without red meat one day each week. No cheating allowed, not even any pale or pink meats as ingredients. 2. iPhoneography is challenging and rewarding, but now it's time to share my photos. Every week in January I will post photos online from my smartphone. Hmmm, I hope I don't miss Photoshop and my Canon PowerShot too much.